Globalworth and One Night Gallery bring together music, visual arts and technology to the next edition of Globalworth District, the first art & tech “neighborhood” in Romania. Globalworth District Event | Music Edition, to be held on April 17 at 18:00 in Globalworth Campus and proposes a new dimension of music through new technologies and creates a collaborative context for Romanian artists from different fields. For one day, the lobby of the Tower 1 office building of the Globalworth Campus (Dimitrie Pompeiu, 4-6) will become a residence for music and party lovers when it hosts a live concert with Tomma Alistar and two themed parties with VRTW – UFe Dj Set and King Rabbit artists – accompanied by interactive and videomapping installations by cuscrew and Adistu. A unique feature of the event will be an art installation that translates into biodist music collected from plants and allows visitors to experience the way the songs change in relation to fluctuations in the environment. Launched at the end of February, Globalworth District, the first “art & tech” neighborhood in Romania, developed by Globalworth and edited by One Night Gallery, aims to promote the young generation of Romanian artists and bring cultural events closer to the community, turning office buildings in unconventional spaces that host and support art and technology. Globalworth District events are built around three pillars: music, visual arts and fashion design that can be experienced in a new way with the help of technology. The visitor thus becomes more than a spectator, able to interact with art and discover it from a new perspective, as in virtual reality or augmented. This year, Globalworth District will host, next to Globalworth District | Music Edition, two other events dedicated to the other two pillars: visual arts and fashion design. Tomma Alistar is a solo project released by Alexei Turcan, which gathers glimpses of all its electronic adventures, combined with classical instruments, all in an effervescent show. 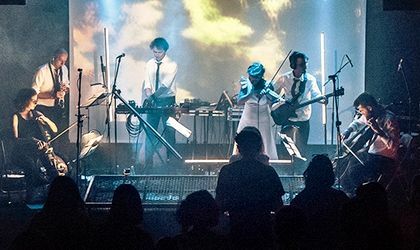 Downtempo jazzy or soundtracks for movies or theater can be found in his shows, and live performance aims to give up electro-automatism and bring back live music with all its imperfections. The partnership between One Night Gallery as a curator of this cultural initiative and VRTW (Vinyl, Rum, Tapas & Wine), the event platform that hosts an impressive array of artists under its umbrella, aims to combine different genres of music and to turn Globalworth’s office space into an art gallery dedicated to music. Thus, the whole concept revolves around the idea of ​​community, which is the core of the Globalworth District – a means of interconnecting people through personalized experiences. Thematic parties at Globalworth District | Music Edition are designed as collaborative works between musicians and visual artists – Ufe, The Rabbit King & cuscrew and Tomma Alistar & Adistu. DJ UFe is a blast of various musical genres. When he does not “dig” after old grooves or blue breakbeats, he’s in his studio “carving” meticulous sounds. His latest project as a producer is Kosmic Blues. This extremely diverse repertoire blends into its own idiom with an imaginative synthesis that makes listening a energetic and exciting experience. The Rabbit King, passionate about vinyls, DJ and producer, proposes a new musical aesthetics: a bit of deep house, techno, disco, while keeping the personal touch. It is a dynamic spirit and has a unique approach that makes it remarkable among DJs. The eclectic music of UFe and Rabbit King will be augmented by cuscrew, a talented young videomapping artist. Its style is a mix between 3D shoegaze graphics and the early ’90s. He has been involved in numerous cultural projects and has been commissioned by such names as Electric Castle, Mindscape Studio, Spotlight, Summer Well and the newly released Kajet Journal. Adistu, digital artist, curator and director of Tripoteca’s art & video itinerary (already known in 14 countries and 25 cities), has had numerous exhibitions and live shows in several events dedicated to visual arts. In his works one can see a predilection for fractals – mathematical models that mimic the evolution of nature and other digital-organic approaches – mash-ups that create worlds and playful characters or suggest metaphysical humor. He will fill Tomma Alistar’s show with visual elements.